Cauliflower has taken over the culinary world the past few years giving us cauliflower pizza crust, cauliflower mashed potatoes and, most prevalent of all, cauliflower rice. So, is cauliflower really that versatile and can it really stand in for rice? The answer is absolutely yes. The trick is to cook it just long enough for the "grains" to soften, but not so long that it becomes mushy and, for that reason, the stir-fried method is ideal for cauli rice. It's a quick cooking, high-heat method that results in the best texture. Serve this as a side dish, a vegetarian entree, or add in some grilled chicken or shrimp for a one-pan healthy and low-carb meal. To make the cauliflower rice, place half of the florets into the bowl of a food processor and pulse about 20 to 25 times. It's important not to overcrowd the bowl or else some pieces will remain too large and others will turn to dust. Pulse a few times, checking in between, until the cauliflower is the approximate size of rice grains. Move the riced cauliflower to a bowl and repeat with the second half of the florets. Heat the olive oil in a large saute pan or cast iron skillet. Add the onion and bell pepper and cook on medium heat until translucent. Add the garlic and continue cooking for an additional minute. Add the carrots and continue cooking for another minute. Stir in the soy sauce, raise the heat to high, and add the riced cauliflower. Saute for a couple of minutes until the cauliflower is heated through. It will begin to soften slightly, but not become too soft. Push the vegetables to the sides of the pan, making a well in the center. Crack in the egg and whisk until the egg scrambles and distributes throughout the vegetable mixture. Season with black pepper and salt, if needed. Stir in the scallions and serve hot. A food processor is by far the easier and more reliable method for getting cauliflower to the correct riced size, but you can grate it using a box grater. 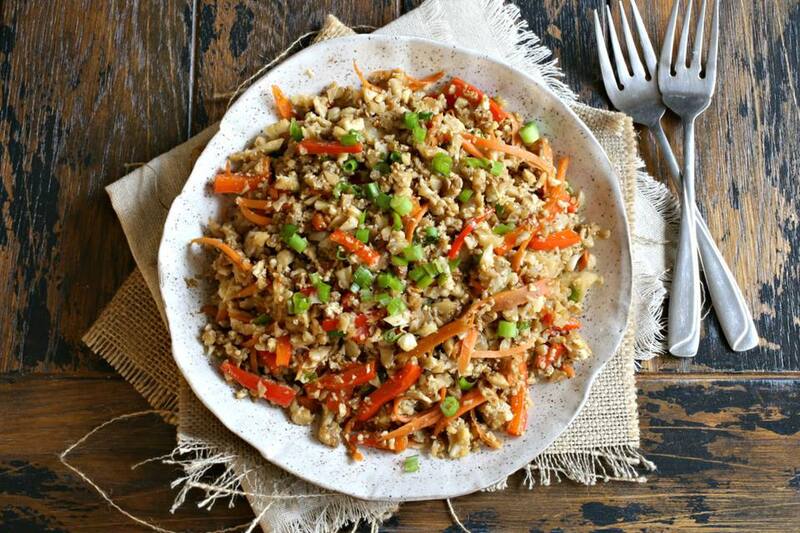 For the best cauliflower fried rice, add the ingredients into the pan based on how long each needs to cook. Therefore, onions and bell peppers go in first and can cook until done without affecting the rest of the ingredients. Once they've softened, add in things like carrots or peas that only need a little time to cook. The cauliflower rice itself will only take a couple of minutes on high heat so that's the last vegetable to go in. Substitute in tamari for the soy sauce to make this entirely gluten free.